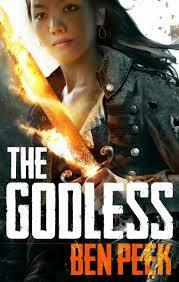 The Godless by Ben Peek is the first in the “Children” trilogy. Peek made big news last year with the sale of this trilogy to Tor UK, a major sale for an Australian author. I’ve enjoyed Peek’s shorter work in the past. Long time readers of the blog might recall my review of Above/Below – a small press publication by Peek and Stephanie Campisi. Given the high profile sale, my interest in Australian speculative fiction generally and my enjoyment of Peek’s previous work, I’ve kept an eye out for the publication of this book. I won’t give much of a plot synopsis – there are plenty of other reviews of this book, most of which have a more comprehensive description of the plot. Broadly, this secondary world fantasy is based on the premise that the Gods all killed each other in a divine war thousands of years before. As they slowly pass away, their power is leeching out into the world, and some humans find themselves the unwitting recipient of some fragment of one of the former Gods’ powers. These powers have a wide variety of effects, but most of the people who survive the onset of their powers become essentially immortal. Most of the story is set around the city of Mireea, built on a mountain range that has formed over the body of one of the dead Gods. Mireea is under threat of siege from an army formed on religious grounds. There are three main viewpoints for the story, Zaifyr – one of the oldest of the “Gods’ Children”, an immortal thousands of years old, Ayae – one of the newest of the Gods’ Children just coming into her power and Bueralan – a mercenary in charge of a small band of saboteurs hired to operate in defence of the city. I must admit that this has been one of my most enjoyable, refreshing reads for 2014. I loved the premise, and in general the concepts behind the writing. It could just be me bringing my own biases into the reading, but I took a lot of parallels between Peek’s post-Gods world and our own slow move out of the shadow of historical religions. The exploration of what it means for society to stand on its own, without reference to supernatural entities. The taking on of power that has been historically seen as the province of the divine. The need to take responsibility to chart our own path forward. The power of even remnants of religion to inspire terrible deeds in the name of holy mandate. I found Peek’s interrogation of these concepts to be quite powerful and thought provoking. If nothing else, the concepts behind this story would have been enough to hook me in. But this is no worthy but dry tome, meant to educate rather than entertain. I found the work utterly engaging, and it was only in reflecting on it later than some of these themes came through (and as I say, I could be ascribing my own biases to the work). The use of language in this work is delightful, the pacing superb. I found the characters to be vividly drawn and compelling in their motivations. In short it was an excellent read. I particularly wanted to highlight Peek’s treatment of time. The work seamlessly switches between the past and the present, echoing his description of the nature of the Gods and subtly preparing the reader for some of the reveals later in the work. While the techniques and style are different, I was left with the same feeling I’d had when I first read Catch 22 – the dips into non-linear story telling was enjoyable on many levels. And to do it with such deceptively simple language and style, the ease with which the reader can follow the changes belying the sophistication of the writing needed to achieve that effect. Just brilliant. I also loved Peek’s treatment of diversity. The novel is by no means a soap box, but built into the fabric of this world was an embrace of diversity that was refreshing. No “default white” characters here – Peek points out the physical characteristics of all characters as they enter the story. Women and men clearly have an equal presence in society. None of this is done in a preachy way, it is presented as mundane fact, woven into the background of the story. I found the plot to be mature and engaging, with enough turns to maintain my interest. I cared about the characters. I wanted to know what happened next. I read the book over only a few days (unheard of for me these days!) and I’m already hanging out for the next book in the series. A fantastic accomplishment well worth the initial publicity, with additional dollops of pleasingness based around the fact it has come from an Australian author. Highly recommended.